One egg has 13 essential nutrients in varying amounts – including the highest quality protein, choline, folate, iron and zinc – for only 75 calories. Eggs play a role in weight management, muscle strength, healthy pregnancy, brain function, eye health and more. Most popular chicken breed raised for egg production is the White Leghorn. Eggs are used as ingredients in such foods as cakes and cookies, or they can be scrambled, fried, poached, or hard-boiled. A hen requires 24 to 26 hours to produce an egg. Thirty minutes later, she starts the process over again. A hard-boiled egg will spin because it’s solid inside ; a raw egg will wobble because it’s liquid inside. Eggs are included in the meat group on the food pyramid because they are the highest quality protein available after mother’s milk. 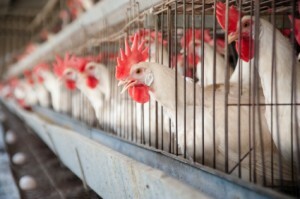 The average laying hen begins producing eggs at 5 to 6 months of age and can produce between 250 and 300 eggs per year. Laying Houses: At a modern egg farm, hens are kept in large laying houses where the light and temperature are controlled and the hens are safe from predators. Inside the houses the hens are kept in cages. The hens are fed a balanced diet high in vitamins and minerals. Laying & Collecting: When a hen lays an egg it rolls down onto a conveyor belt with all the other eggs that carries them to the processing facility. Hundreds of eggs can be moving along the conveyor belt at any one time. Cleaning: First, the eggs are washed to remove dirt and debris, and then sanitized to remove bacteria from the shell. A light coating of mineral oil is sprayed on the egg to seal the tiny pores in the shell. This process slows down aging and prevents bacteria from entering the pores. Candling and Grading: The eggs are passed over a very strong light called candling. The strong light allows a worker, called the Candler, to inspect the exterior and contents without cracking the shell. The Candler grades the eggs AA, A or B, based on the quality of the interior and exterior. Eggs that don’t meet the guidelines are removed. Sorting: Next, a machine automatically sorts the eggs according to size. Sizing: Eggs can be Jumbo, Extra Large, Large, Medium, Small or Peewee. Generally, a hen lays larger eggs as she gets older. The breed of the hen also is a factor in egg size, along with nutrition, and environment. 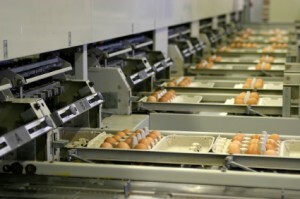 Packing: A special machine carefully places the eggs, small end down, in cartons that protect them from breakage. The cartons are marked with the grade and size. Cooling: After packing, the eggs are placed in a large refrigerated room where they are cooled to 45 degrees F to maintain quality and freshness. Shipping: The eggs are shipped to grocery stores in refrigerated trucks. 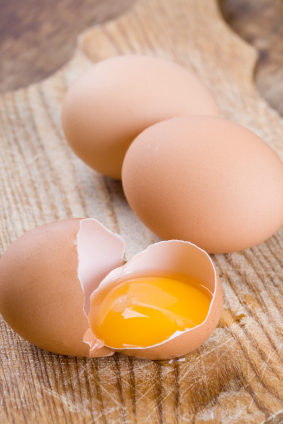 Typically, an egg reaches the grocery store shelf just 3 to 4 days after it was laid. Marketing: To maintain freshness and quality, the grocery store keeps the eggs in a refrigerated display case where they are purchased by the consumer. Outer covering of egg, composed largely of calcium carbonate. May be white or brown depending on breed of chicken. 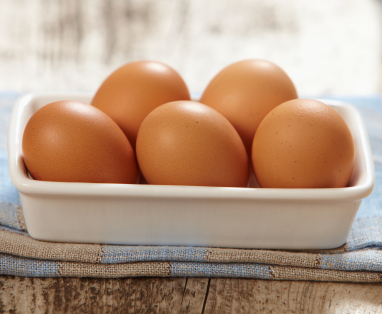 Color does not affect egg quality, cooking characteristics, nutritive value or shell thickness. Two membranes-inner and outer- that surround the albumen. Provide protective barrier against bacterial penetration. Air cell forms between these two membranes. Pocket of air formed at the large end of egg. Caused by contraction of the contents during cooling after laying. Increases in size as egg ages. Spreads around thick white of high-quality egg. Major source of egg riboflavin and protein. Stands higher and spreads less in higher-grade eggs. Thins and becomes indistinguishable from thin white in lower-grade eggs. Twisted, cordlike strands of egg white. Anchor yolk in center of egg. The area of the egg which will form the embryo if egg were fertilized. Color varies with feed of the hen, but doesn’t indicate nutritive content.